The spring semester is officially over, which means I now have more time to write and update the blog! Here are my new YouTube videos. I made two shopping hauls in response to the small population of plus sizes on YouTube. 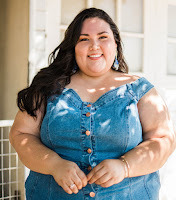 The fatshion blogging community is so large (no pun intended) and rapidly growing, which is cause to wonder why such a community hardly exists in a vast sea of vlogs. I know I'm not the best on camera, with my side glances as I think before I speak and overuse of the word, "like," but I continue to vlog because its fun, easier to do when I don't have time to write, and shows YouTube that fat girls have fashion and beauty skills, too. Do any of you make videos? If so, please share your link in the comments section! heehee & i love that u say "ridonculous"! love that word! I also made my first video some days ago, but I feel somehow stupid xD Don't like to hear myself talking. Yours is very nice and your clothes are great. I love that dress from Forever21! Very Pretty! keep up with the videos! i enjoyed seeing some pieces from your wardrobe & style. u are soooo adorable love! and i want all ure finds. ASAP. and i ditto IZA ... im a straight up fob and flip flops are definitely shoes. lol! Yay love these! I think the striped top and blazer are my favorites! Also omg you look so beautiful in the videos! You are so cute girl! I love the videos. I might make some myself if i'm brave enough! I love the alice + olivia for Payless flats! I thought about getting them but opted not to and instead got an adorable pair of black and white oxfords, from the same collection (available online). I hate my voice so I can't vlog, but you do it so well :) Good for you! Great videos! I just started my own blog to help inspire and challenge myself to wear different things. It's great to see stylish young women who are truly plus size, not the industry 'plus size' which is no more than a 12, dressing to please themselves and pushing the boundaries of whats 'acceptable' for fat girls to wear! Tried to find the sequin shoes on payless.com and couldn't! =( Although, now I am shoe shopping. Already bought like 6 pairs for summer. P.S. Vegas people wear flip flops, it's "flippin" hot! haha ;) Plus i'm from Cali so I get to wear them by default. @ Iza, I say you “borrow” your bf’s watch asap! @ Katrin, Aw, don’t say that. I just watched your video and it was cute. @ LaCara, thank you! And thanks for subscribing on youtube! @ Jaida, thank you! You need to make a video, too! @ Fatshion forward, thanks so much. Great name, by the way! @ Mike, lol, thanks. I’ll keep that in mind for future videos. @ J, no, you’re beautiful! I can’t stop wearing the blazer. Its my new favorite out of all the things I’ve purchased recently. @ pearlslaceandruffles, please do! They get easier and more fun to make as time goes on. @ Natalie, the Alice + Oliva black and white oxfords are so fab. I want the blush pink pair! @ Meshawn, thank you very much! I’ve always been about dressing my body to its best, no matter what size or weight I may be. Being fat is not an excuse for poor dressing in my world. @ Moya2bean, thank you for following!! @ Devon, girl, I don’t like my voice (sometimes) but vlogging is so fun that I just learned to get over it. Now my singing voice, that’s a whole other story. Dreadful! @ BB, thanks. I’ve received that a lot lately - people are happy to see someone that is of my size taking pictures/making videos because they may be of a similar size, too. Fat girls come in all sizes and forms. And if someone out there can relate to me, that makes me feel very honored and privileged to have made such an impression! @ Oliva, I just e-mailed you. Check it out! @ Amanda, 6 pairs?! I have to see what you’ve bought lately. I’m sure its all very cute! And LOL @ the Vegas comment. Vegas people get a pass because its hot as hell out there! and thanks for the mention! glad you like the booties, I put those inserts in mine too! I agree with you about Avenue...very hit or miss. Love your blog, great video! You're so adorable! I love your style!